✓ Made of natural wood, First Choice disposable utensils are an excellent affordable option for your entertaining needs. ✓ They are good for family get-togethers, holiday picnics, kids' parties, showers, receptions, weddings company luncheons, for all special occasions. ✓ Party responsibly, respect our planet, have fun and 'Enjoy'. ✓ 100% natural, 100% biodegradable, 100% compostable. ✓ Untreated birch wooden utensils. ✓ Intented for single use. ✓ They are good to use with both cold food and hot food. We Guarantee 100% Money Back With No Questions Asked! 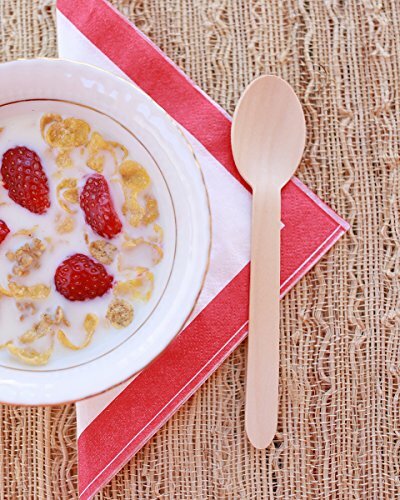 First Choice wooden cutlery is made from 100% natural & sustainable birch wood that is harvested from F.S.C. (Forest Stewardship Council) certified replanted and sustainable forests. First Choice wooden utensils are SGS approved for food contact also has possessed BRC Global Standard. 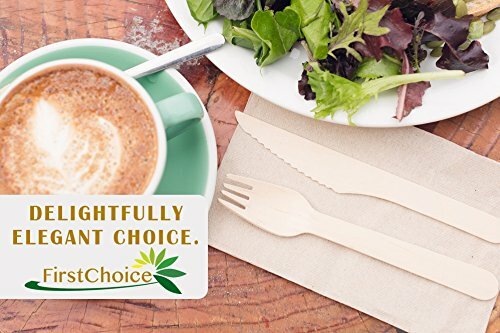 First Choice disposable utensils are compostable and biodegradable with no glazes, bleaches, or dyes. Wooden catering presents unique looks with side dishes thanks to its sturdy construction and designed for durability and strength. DONATE for a better world. FirstChoice proudly donates 10% of its annual net profits to non-profit environmental organizations. There are many non-profit charities around the world, each with their own missions to help the environment. First Choice is proud to be a part of the community and committed to support these non-profit organizations. FirstChoice also help environment by providing you fully compostable products to use in your daily life. 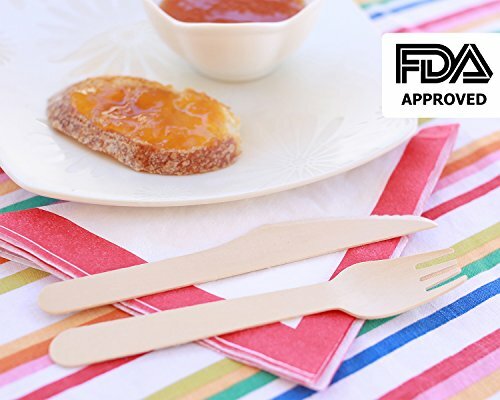 FDA Approved STYLISH PARTY UTENSILS: FirstChoice gives you the convenience of disposable cutlery but in a stylish, eco-friendly material and design that enhances the look of any table. They are good for family get-togethers, holiday picnics, kids' parties, showers, receptions, weddings, company luncheons, for all special occasions. MODERN AND CHIC: From fast food restaurants to five star hotels, our clients love the look, feel, and quality of our compostable wooden cutlery. Provide an elegant alternative to traditional disposable utensils at your take-out restaurant, cafe, coffee shop, or break room. Ultra cool, modern, and chic, wooden flatware has become a go-to option for everyone when choosing disposable utensils. SMOOTH, STRONG, DURABLE: FirstChoice Wooden Cutlery products are smooth, strong, durable, and will impress your guests, staff, and customers. They are also crafted with FSC-certified birch wood. FSC (Forest Stewardship Council) is the industry benchmark for sustainably managed wood and wood products. GO GREEN: Offer your guests an eco-friendly option for flatware with this environment friendly disposable wooden heavy weight cutlery set! You can feel better when you throw these away; they are 100% biodegradable. Our high quality birch wood cutlery can be your solution in helping you "GO GREEN".